As the President and Co-Founder of Accu-Test Labs, Ltd., Kenneth Waites brings an effective blend of vision, proven performance and expertise. 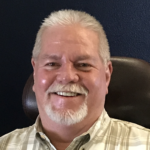 His background stretches from the oilfields to progressive leadership positions in industry leaders such as Bodycote Materials Testing, Omni Testing Laboratories, A.M. Castle & Co., C-L Metals, Inc and Griffin Well Services. His rich and valuable knowledge goes well beyond traditional measurements. Waites vision and commitment for Accu-Test Labs is to be an industry leader through innovation and establishing standard setting initiatives across the industries served. The company is committed to recapturing transparency as a corporate partner and leveraging strategic alliances. The company’s focus and values center on quality and continuous improvement and contribution.